One of the new release smartphone of CloudFone, the CloudFone Excite 402D which had been quoted to par with Cherry Mobile flare, both are mid player smartphone which comprises of 1.2Ghz Dual Core processor. 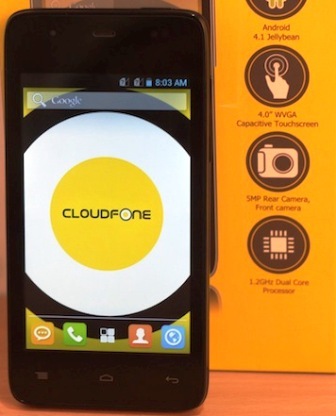 This new line up of CloudFone has already hit the stores nationwide, as well as on online stores. Given the fact that CloudFone Excite 402D has almost the same specs as CM Flare, CloudFone claims that Excite 402D will have the upper-hand in terms of durability and after-sales support, lets just do hope they will kept this statement. One advantage of CloudFone Excite 402D over other dual core smartphone, is that you won't gonna need to stress yourself finding on on how to upgrade your OS, as 402D is pre-installed with Android Jelly Bean 4.1, while running on this OS gives your phone more app compatibility, and at the same time enjoy the features of Jelly Bean. Priced at Php3,999 (Again same as Flare). There is one question that I want to ask to CloudFone, are you mocking Cherry Mobile? And the smartphone competition just keeps getting better and better. In case you miss it, Excite 402D is priced at Php3,999 | Available now in the Philippines nationwide on CloudFone Stores, Online Stores, and authorized sellers. What's in the box of Cloudfone Excite 402D? 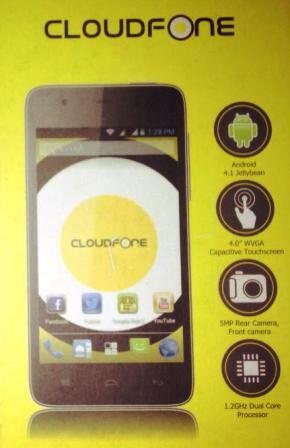 If you happen to have CloudFone Excite 402D, kindly share your experience with us! Thanks. Adreno 203 lang GPU niyan, wag paloko! Labo naman cam ng cloudefone. . .asar!! !